Mutant Year Zero: Road to Eden is developed by The Bearded Ladies Consulting that put out Landit Bandit in 2010 – the simulator of Leonardo da Vinci’s prototypical helicopter. The new project is created in the Mutant franchise. It debuted 1984 as a board game made by Target Games. Currently, the IP belongs to Cabinet Group, and Heroic Signatures have the rights to create interactive games in the series. 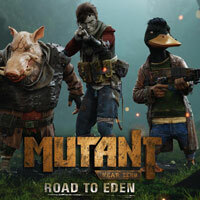 It is cofounded by FunCom – the publisher of Mutant Year Zero: Road to Eden. Mutant Year Zero: Road to Eden is a mixture of an adventure and a stealth game with a turn-based combat system, inspired by the XCOM series. The Ark serves as the base for all the shady adventurers, where you can buy supplies and prepare for the next journeys. Travelling takes place in real time. Once an enemy is detected, the heroes hide and, while is the stealth mode, they sneak up undetected to an enemy base or take advantageous positions for an attack. Combat is turn based. The characters move in turns, make use of environment elements by e.g. taking cover behind walls (which can be destroyed), and attack with weapons and unique abilities, like the stone skin of Selma or Bormin’s charge. The game offers a development system of the characters and loot. During gameplay, the players obtain new equipment, including weapons (from slingshots to rifles) and clothes (e.g. bulletproof vests or a cylinder). The production is powered by Unreal Engine used in such games as Gears of War 4 and Playerunknown’s Battlegrounds. The visuals are very decent, and the world’s design deserves special recognition.